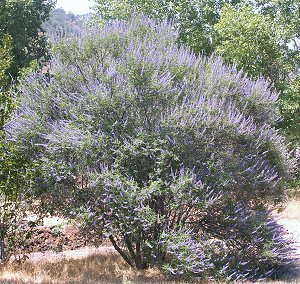 Even though often referred to as Chaste Tree, Vitex is really a multi-trunked shrub that grows fairly slowly to about 15 feet. In the picture on the right, this mature Vitex cascades all the way to the ground making a spectacular show every summer. Related to Lemon Verbena and Vervain, in the family Verbenaceae, Vitex is originally from the Mediterranean and western Asia. Where winters are marginal for the plant's survival (Zone 6), the bush may die back to the ground. Here in Zone 8, where winters are usually in the mid to lower 20's, it goes dormant, losing its leaves, but usually does not lose its branches. Any branch that might not make it through the winter is pruned out once the bush has broken dormancy which can be quite late in spring. Vitex leaves are hand-sized and consist of five to seven fingers that are dark green above and silvery underneath. While fairly drought resistant, Vitex grows faster and looks lovelier when watered regularly. Grape-colored flowers cover long panicles that can elongate up to 12 inches. Starting in early summer, flowers begin opening from the bottom of the flower stem and continue up the stem over the course of four or five weeks until the bush is completely blanketed in eye-popping bloom. Harvesting these flowers early in the bloom cycle is the best way to preserve them for craft use. They may be used fresh or hung upside down in small bunches for drying. As the flowers of summer fade, small dark purple berries follow. In the past these berries have been dried and used as a rather weak substitute for pepper and as an ingredient in Mediterranean spice mixtures. In the 6th century, the ground dried berries were touted as a must for monks trying to maintain their vows of chastity (thus, the common name Monk's Pepper). Vitex is now considered a vital herb for regulating and relieving menstrual problems and infertility. For a good discussion of the medicinal properties of Vitex, check in Andrew Chevalier's book The Encyclopedia of Herbal Medicine. This book will guide you through the steps of harvesting and preparing remedies from your garden. 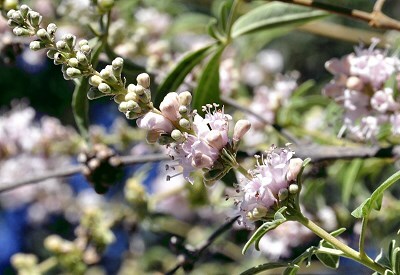 Medicinal, Ornamental Due to lack of interest, Vitex has been discontinued.